As the daughter of a famed author, Isolde Ophelia Goodnight grew up on tales of brave knights and fair maidens. She never doubted romance would be in her future, too. The storybooks offered endless possibilities. And as she grew older, Izzy crossed them off. One by one by one. Rescued from drudgery by charming prince? Now Izzy's given up yearning for romance. She'll settle for a roof over her head. What fairy tales are left over for an impoverished 26-year-old woman who's never even been kissed? After eight years of waiting for Piers Brandon, the wandering Marquess of Granville, to set a wedding date, Clio Whitmore has had enough. 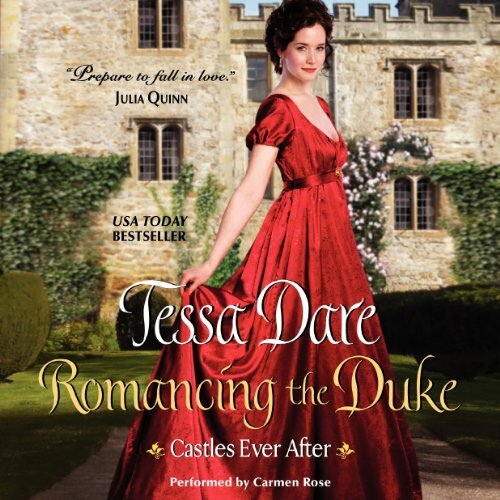 She's inherited a castle, scraped together some pride, and made plans to break her engagement. Not if Rafe Brandon can help it. A ruthless prizefighter and notorious rake, Rafe is determined that Clio will marry his brother - even if he has to plan the dratted wedding himself. My first Tessa Dare miss. I'm so sad. On the cusp of her first London season, Miss Madeline Gracechurch was shy, pretty, and talented with a drawing pencil but hopelessly awkward with gentlemen. She was certain to be a dismal failure on the London marriage mart. So Maddie did what generations of shy, awkward young ladies have done: She invented a sweetheart.